In and around the time of the Industrial Revolution, it was common place for housing built in the UK to feature natural slate roofs. At the time of the Industrial Revolution, the slate was sourced from the vast slate quarries and mines in North Wales, Lake District, Cornwall and Scotland. 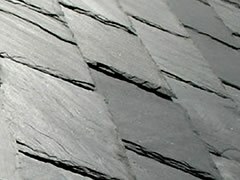 In the UK, natural slate roofs are considered an integral part of roofing history. Slate is still a roofing media of choice today; through either the desire to maintain local, traditional roofing materials, for planning purposes in conservation areas, or personal preference. However, not all slate is suitable for use as a roofing material, it must comply with the quality standards set in the European Standard framework. Frequently, legal disputes occur between a customer and supplier when the slates provided are not considered to be of the quality expected. As a result investigations are often carried out to determine the quality and usability of the slate. Lucideon (then Ceram) was commissioned by Prettys Solicitors to assist in a case involving a roof recently tiled in imported Spanish slate. The client noticed that within a few months of the roof being completed, the slates had begun to discolour and stain. With this in mind, the client was concerned the slates were not fit for purpose, which may lead to the water-tightness of the roof becoming compromised. A natural stone expert from Lucideon undertook a detailed investigation of the slate, identifying the nature and degree of the staining and discoloration. The staining had two distinct forms; a brown (rusty) stain or an iridescent ‘petrol on water’ coloured stain. The report identified the number of slates affected and the cause of the stain to be pyrite. In detail, the report reviewed the reasons why this occurs in certain slates and the process by which the staining occurs. The report was used to assess if a claim against the slate supplier was likely to be upheld, should the case progress to court. Ultimately the client was happy in the knowledge that the slates would not fail in the near future and the water-tightness of the roof would not to be compromised. In essence the problem was aesthetic, and unlikely to have a major impact upon function. In other such cases, the investigation results have led to claims for a replacement of the slates, specifically when the slate originated from recognised problematic areas of the world.